Over the past year or so I’ve really discovered my taste and design choices have changed from a few years ago. This has led to huge design challenges in my home decor. Since I don’t have the budget to just toss it all and start over I’ve had to get creative. 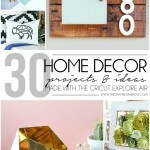 This means lots of DIY’d projects, and recycling current decor to make it new again. This year I’ve been able to create some pieces I really love, whether it’s a fun pillow for my bedroom or some unique succulent planters they’ve all been either free using what I had on hand or they were extremely inexpensive to create. The Cricut Explore Air has really helped me to think outside the box this year, saving me money on decor…and allowing me to experiment with ideas that would have taken twice as long to create by hand previously. 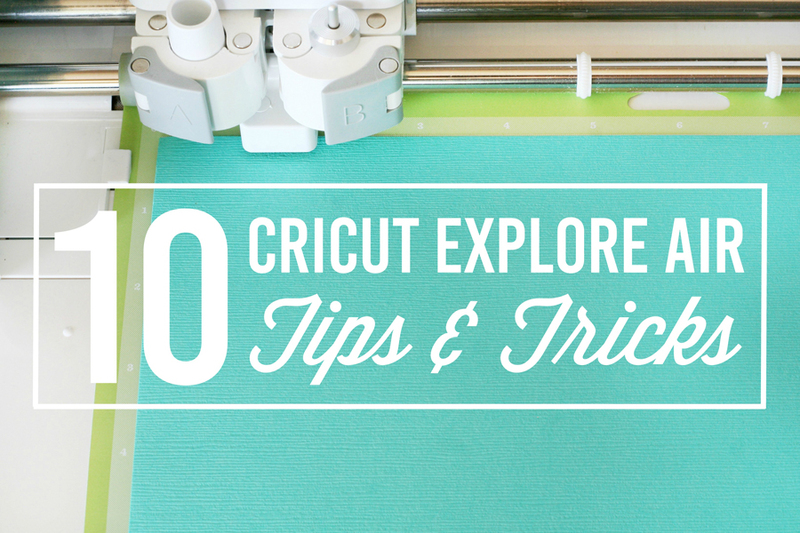 Today I thought I’d share these 10 Cricut Explore Air Tips & Tricks that I use all the time, I hope they will help save you time and money when creating amazing projects with your Cricut Explore Air. One of my favorite things about the Cricut Explore Air is the ability to cut my own files. 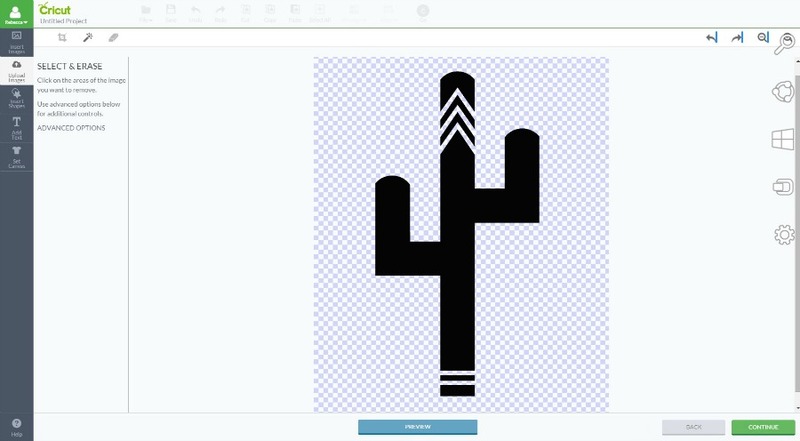 You can upload any SVG, PNG, JPG files easily and transform them into a cuttable image for FREE. 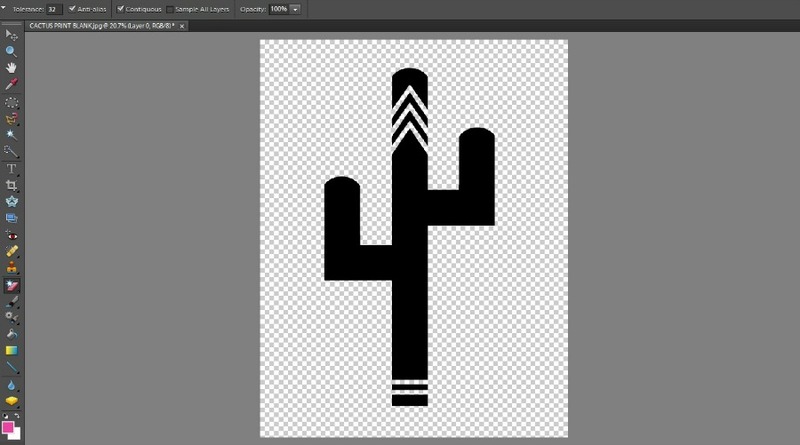 You can create custom images in programs like Photoshop, or PicMonkey.com – when creating the images you can choose either a white or transparent background. The transparent background will be less work in the long run since it means you won’t have to weed anything when you upload your image into Design Space. Just be sure to save all your personal images as PNG, although JPG also work if you found an image online that you want to use. 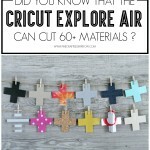 A couple of months ago I shared THIS fun post about all the fun things the Cricut Explore Air can cut. It’s always a great idea to test out the material you want to work with first, that way you can execute the project without running into a problem. Especially when it comes to materials like felt, fabric, or wood. Cricut now offers a variety of color choices for their pens that fit perfectly into the pen holders on the machines that you can purchase online or in stores where Cricut is sold. Mandy from Vintage Revivals reminded us all of a great tip last year. Instead of peeling your paper away from the cutting mat, peel the cutting mat away from the paper. Rolling the mat backwards away from the material your cutting (especially paper) will result in a flat and nicely cut project. If you don’t follow this tip you will be left with a curled mess. I go through cutting mats like crazy, so to make them last just a bit longer it helps to clean them a bit. One way is to use a lint roller to clean the mat after each use. First, be sure you’ve removed all the little paper pieces that can get left behind if you’ve cut something detailed. Then I like to use a lint roller to go over the mat, especially if glittered cardstock was previously cut on it. This helps to remove some, not all – but some of the dirt and lint that can build up on the mats. Between each use, I am sure to replace the plastic protective sheet that came with it. Especially since my house has pets. You can also wash your mats. With lukewarm water and mild dish soap gently massage the mat in a circular motion and then rinse. Let it air dry. If you’re in a bind and need to cut something like vinyl and your mat isn’t sticky enough to hold it in place you can use masking tape or painters tape to hold it in place on your mat. Just tape small pieces along the outer edges of the mat and your vinyl. 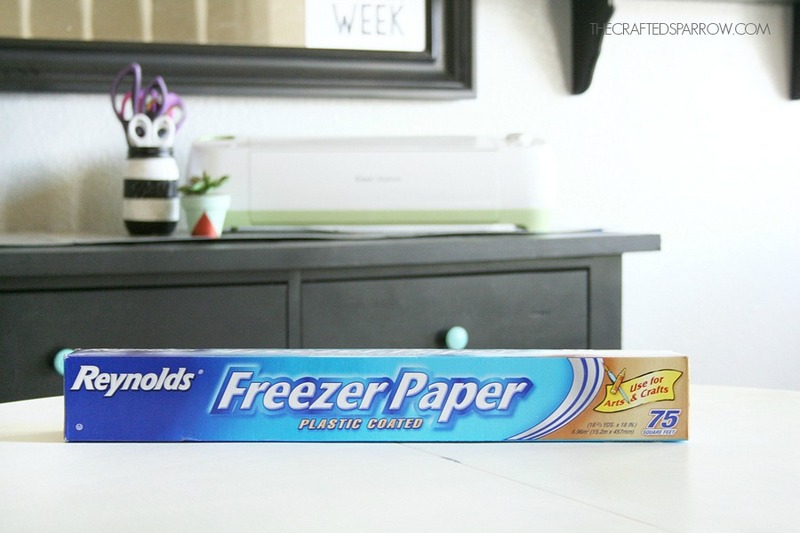 Did you know that Freezer Paper is amazing? Well it is, and I’ve been using it for years to create custom stencils for fabric. Here are just a couple of the shirts I’ve created using it: DIY Geek Inspired Shirt, DIY Halloween Shirt, DIY Boy’s Valentine’s Shirt. 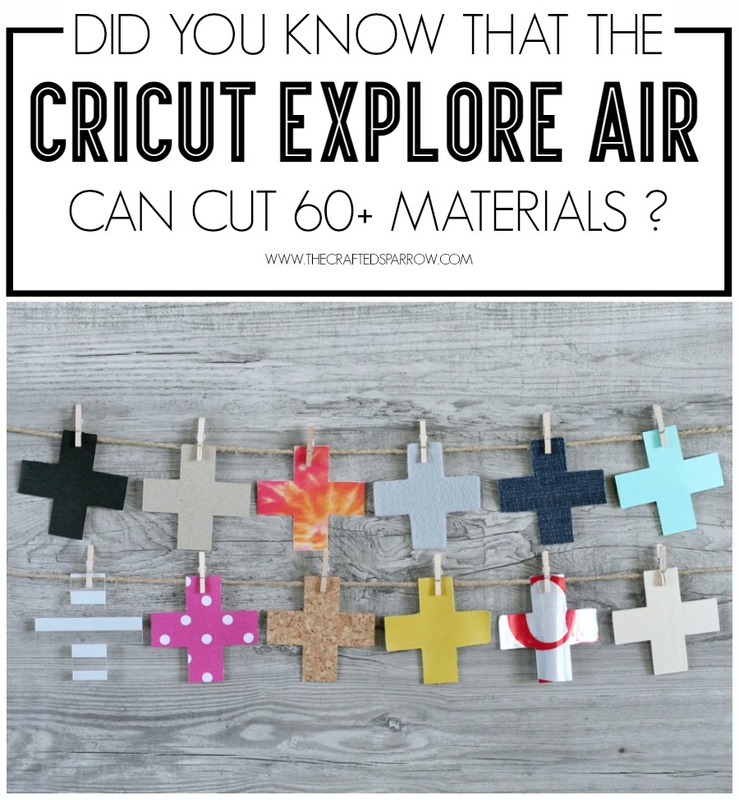 My favorite part of using this method is that I can use it with the Cricut Explore Air. I used to have to use an Xacto knife to cut my designs years ago, and now it’s a piece of cake with the explore. I just upload or design whatever I want in Design Space and cut. Depending on what materials you’re cutting for a project I always suggest using different blades. Yes there are deep cut and regular cut blades that is not what I’m talking about. I keep separate blades for cutting vinyl, fabric, and paper primarily. I keep them organized by painting the tips of each plastic blade cap that comes with each blade with a dot of nail polish. It’s just like a pair of fabric shears, you wouldn’t cut paper with them…would you? So keep them sharp and awesome by keeping them separate. You can make a small chart of what blades are for what material, just tape it to the inside of your blade storage compartment. Each time you use the blade just remember to replace the right plastic cap so they don’t get mixed up. 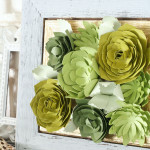 Cricut.com has a complete Cutting Guide of materials which you can find HERE. To break it down even further for your convenience Scrap Me Quick Designs put together a great alphabetical list of all the cut materials and settings needed. This is perfect for quick reference. Go download a copy HERE. Did you know that you could spray paint your vinyl if you need a color on the fly? Let’s say you have an abundance of pink vinyl and you would really love some awesome gold vinyl for a fun project. Grab some Rustoleum Metallics Gold spray paint and give your un-cut vinyl a quick spray. Once it’s dry you can cut it like normal. 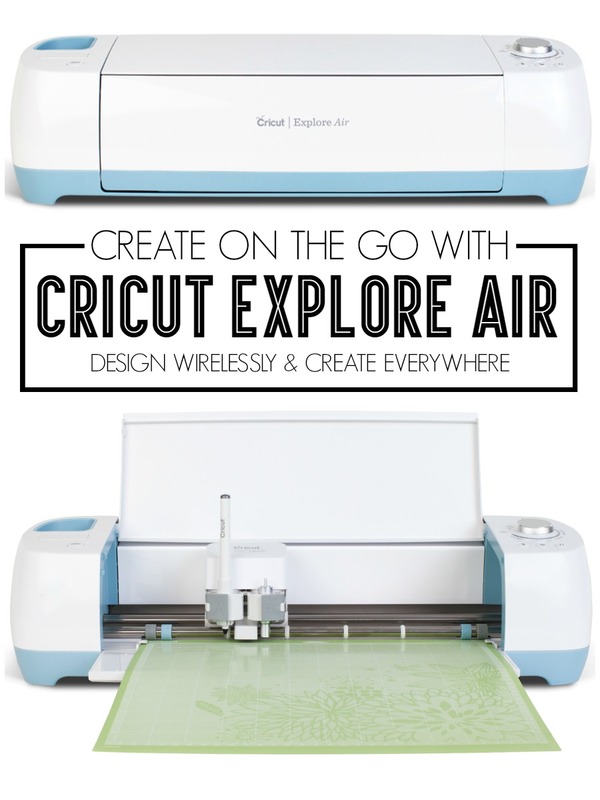 Want to learn more about the Cricut Explore Air? Check out these posts! I am loving these posts, I just got the Explore Air. They have been beyond helpful to a newbie who has no idea what she’s doing! I really have a question. 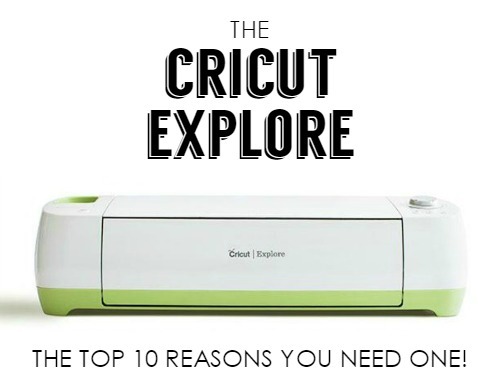 I just bought my cricut explore. I did cut a couple of vinyl letters for my daughter. When we set up the third one it cuts but not totally through to the vinyl. Do you know how I might fix this or what could be wrong with it. I would really appreciate any help cuz I am totally frustrated now that I might have broken it. Hi Lee, I’m sorry you’re having problems. What kind of vinyl were you trying to cut? Is it glittered or solid colored vinyl? Is the dial in the correct position “set to vinyl”? The blade automatically adjusts when you turn the dial so it shouldn’t be that. Have you taken the blade out to check to see if there is a piece of vinyl stuck to it or debri? Also are you using the mat to cut the vinyl on , if not the machine doesn’t cut properly without the mat. Let me know all those things and we can go from there. The other option is to call Cricut’s support (they are awesome) and they can walk you through some problem solving. 🙂 Hope you get it working so you can keep creating! Love the idea of making custom vinyl colours! Thanks for the idea! Thanks so much Narelle. Yes, you need to stock up on both of those things – they are both great products to aid in crafting! Joining your fb group now! 🙂 Have a great weekend. I have had the cricut expressions 2 for some time and absolutely love it. I recently bought the Cricut Explorer Air because I love the bluetooth accessability and the uploading my own images, HOWEVER…..the problem I am having. I am trying to cut small vinyl letters like 1/4″ and the letters are lifing and just making a mess. On the expressions I could slow the blade down to cut very slow, any suggesions for the Explorer? Hi Kristi, So sorry you’re having problems with the Explore cutting. The only thing I can think of is the blade itself. Have you used it previously to cut glittered cardstock or any rough materials? I know my blades have a harder time cutting when I have cut wood or glittered products before the vinyl. I try use separate blades for these items, it helps them to last longer. Another problem might be the vinyl, what brand are you using? Also, if the font you are using has lots of turns like a script it might be harder to cut at that size. Let me know if it works for you! I tried my first project last evening and was disappointed to have a cutting problem right away. While the machine was cutting the image, it would add deep, straight cuts right through the image which ruined it. Has anyone else had this problem? I just got my explore air and want to use pictures from my computer but not able to get to my computer files to bring them up on the mat to work with them I noticed that others have things down the left side to upload I don’t have anything there what do I need to do. I am trying out the different markers in my Explore. I see you said that the sharpie fine point works. The picture shows the ultra fine point, and I tried that, but it doesn’t fit in my Explore. Are you sure about that one? I have a ton of those, so I’d love for it to work, but it’s too fat around to fit into the holder. 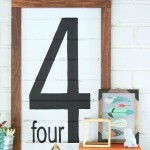 Is there a clear/transparent vinyl I can use to make wall art? I want to create word using the cricut pen. I cannot find vinyl to write on..
Hi Sherrie, I have heard numerous ladies comment that they use Clear Contact Paper in their machines for misc. projects. I have also seen clear vinyl sold from vendors, a quick google search might lead you to some. 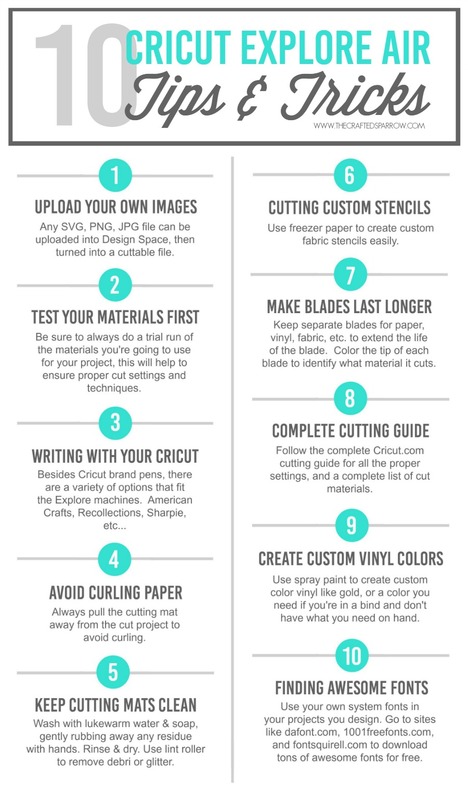 A great facebook group to ask is “Cricut Lovers Guide to Design Space”. They know tons of tips and tricks and have great advice. 🙂 Hope that helps. Can you tell me how to upload an SVG file into the software so it is the actual size?! I can’t find any information on this and have tried every format available only to have the image load onto the screen at different size than u designed it for and every format will load a different size! I need it to stay the same size so I can use it as an embroidery applique. Hi Cheryl, that’s a great question. I honestly don’t know the answer to this question…but you could either call customer support and they are great about helping with questions or there is a great Facebook group called Cricut Lovers Guide to Design Space and those ladies know their Cricut Explores! They are a great resource for any questions, I bet they’ll know. Hope that helps. I downloaded a bunch of fonts, how to I upload them to my cricut design space? I have to go to Downloads and click Install. Then the show up on all programs that I use. I have a cricut explore air and I love it! I bought it for Christmas, and I am just now sitting down to play with it. ( I had on older model and gave that to my mom, she loves it) I have been looking on Pintrest looking for ideas and came across your post. I have also seen on another bloggers post that with they were able to engrave on an aluminium tag ( not a cricut machine). Just wondering if you know if the cricut can do the same? Hi Sherry, you’re in luck! I believe the Cricut Explore can engrave too, I’ve seen some ladies in the facebook group “Cricut Lovers Guide to Design Space” talk about it recently. I don’t have any experience with it personally. I suggest asking to join that group on facebook and enjoy all the knowledge they have, it’s awesome! Happy crafting! I recently bought the Cricut Explore Air but have not even opened it yet. I’m waiting til I have a free day to play with it. However, I have a question which I can’t seem to find the answer to. Does the Cricut and everything I can add to it (i.e. Downloading images, fonts, etc.) use a lot of memory? I have an old laptop which is need of replacing and I want to be sure to get one with enough memory to use everything I can for my Cricut as well as saving pictures etc. Hi Maggie! Oh man, I wish I knew the answer to this question. I have new computers so I’m not really sure how to find that out. 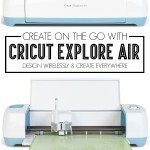 There is an amazing FB group called “Cricut Lovers Guide to Design Space” and I would suggest asking to join the group, they are all so knowledgeable and always have answers quickly to problems, questions, and tips. Good luck. Thanks, not a fan of FB but thanks anyway for the suggestion. I believe all the information is stored on your profile via internet, not on your computer, You should be okay. 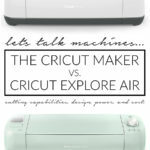 Nice round-up of why I love the Cricut. It’s so well supported! Thanks Alice, I agree that’s such a great feature to the Explore! 🙂 Have a great week. they love to answer questions and have so many tips and tricks, they are the people to ask on how to avoid this. Hope that helps. I, too, was having problems until I found the Custom setting for fine details! I created a piece with all words. I had them all in “write” mode, after three lines of writing it changed over to cutting. How do you get a font from dafonts.com to . your cricket to be able to download. We have tried to download to Any font to iPad to be able to get font we can use. It’s not working .what are we doing wrong. Having problems with my vinyl tearing. Tried new blade, new mat. What am I doing wrong. I have the cricut air. If for some reason they don’t know, be sure to contact Customer Support for more troubleshooting. I find tearing occurs if the machine in on the wrong setting, I had a project that continued to tear so I just moved the dial one more dot thicker and then didn’t have another issue. Hi, I have owned my cricut for about 7 months now and an just starting to get into vinyl. I have a project where I am making jam and applesauce jars for Christmas presents and want to put a cute little tag on the top. Only I can’t find a marker that will write on any of the vinyl. Any suggestions on vinyl or markers to use? I really want to use the vinyl because I think it will turn out better than other materials. I have a design already made that requires markers/pens. Hello…i am new to the Cricut and I was wondering if anyone knows about cutting stencils…..I can cut stencils but the problem i am having is, how do you go about not losing parts of the words, like the center of “o”‘s and P’s a’s . things like that….can you tell me what is the best way to keep those pieces in words so that when i use a stencil i dont have to stick those pieces into place…..would the design studio software help and does it enable you to make cursive words??? thank you for any help……..
I’m cutting stencils from mylar so that I can reuse them over again. I’m not sure how to keep the centers of the letters like p and o attached. I have heard that there is a way of creating a “bridge” or “handle” so that the centers are still attached. Then once done painting, you have to go back in with a brush and paint in the bridge area so that the letter looks complete. I’m having trouble finding the answer cricut. Thank you! 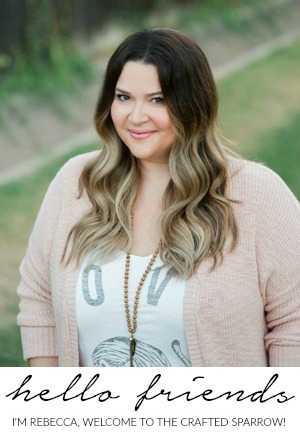 Hi Rebecca, some fabulous tips and tricks here! Love the sites to download fonts from and also thanks for the recommendation of the Facebook Group (I think I saw it in one of your replies to a comment). I think it can take time to get your head around how a new vinyl cutter works but once you have it the crafty creations are endless! I just made my firs transfers for our wine glasses, so excited to get stuck into heat transfers too! Thanks Samantha! 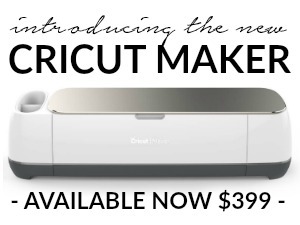 The Cricut is my favorite crafting tool and I’m sure it will soon become yours too! So many possibilities! Thanks very much for sharing these tips! My wife just bought the Explore Air 2 as she’s about to start her first year teaching. We are having trouble with cutting cardstock. The blade doesn’t seem to cut all the way through the cardstock, leaving some unclean cuts when the shape is peeled away from the remaining cardstock. Have you had this experience and, if so, do you have any suggestions on resolving it? Hello. I’ve been researching cutters and had decided on the Air 2 however I just had a friend inform me that I need to pay a monthly fee to be able to use my own or purchased svg images or fonts from my pc. However I was told by yet another friend that I do not. Now I’m even more confused and don’t know which is the case and will fill my needs as a crafter. I really don’t want to have to pay a monthly fee as I don’t intend to make a business out of it but more or less craft for family and friends. Any adivce you can offer would be appreciated. Thank you.